The Shotley Peninsula is a pastoral scattering of gentle hamlets along high hedged lanes which thread over hills and through woodlands. Other settlements line the Orwell estuary, the full drama of the wide water and forests beyond constantly on show. The road along the northern shore is a busy one, as is the Ipswich to Manningtree road which cuts the Peninsula off from the rest of Suffolk, but otherwise this is an introspective, secretive landscape, especially on the southern side. No wonder people long to live there. The Peninsula has only two places of any real size; broad functional Shotley itself, at the eastern tip, and Holbrook to the west, a rather more prosperous proposition. Holbrook is home to the famous Royal Hospital School, a vast 1930s neo-classical confection designed for the sons and daughters of the Navy. Its campanile tower is a landmark for miles around; you can see it from tower blocks in the centre of Ipswich. The school inhabits a large campus to the south of the village, and injects lifeblood into the local economy. So here we still have jobs, and shops, a high school and a couple of pubs. Oh, and a pretty village church, behind a high hedge. The village is rather a suburban one; such an economy generates and thrives on traffic, and all the peninsula comes here to stock up. At first sight, the arrangement of the church is a bit odd. This is one of the 14th Century south-east towers commonly found in the Ipswich area, and the nave to the north of it was probably contemporary with it. But a small, low south aisle was built a century later, running eastwards of it, and the effect now is of a tiny church with a huge north aisle. In fact, there is a 19th century north aisle beyond the nave, the work of Diocesan architect Richard Phipson; it has a rather awkward juxtaposition with the nave at the west end, with an angled doorway. The nave west window appears to be made of terracotta. The best feature of the exterior is the clerestory, somewhat hidden by the south aisle, but picked out beautifully in red brick. The interior is almost entirely Victorian, again the work of Richard Phipson. Although it now has a fairly rustic and simple Low Church feel to it, which is very pleasant, a glance at the chancel shows that Phipson fitted it out for the kind of mystical, incense-led 19th Century High Church worship which he loved, and for which his St Mary le Tower in Ipswich is the crowning moment in Suffolk. Most of the fittings are now gone, but the sense of the past remains. Holbrook church contains one major pre-Victorian survival. This is the monument to one of the arch-villains of the English Reformation. It is a huge memorial at the east end of the south aisle. Sir John Clenche is the figure above his daughter-in-law on the huge memorial in the south aisle. 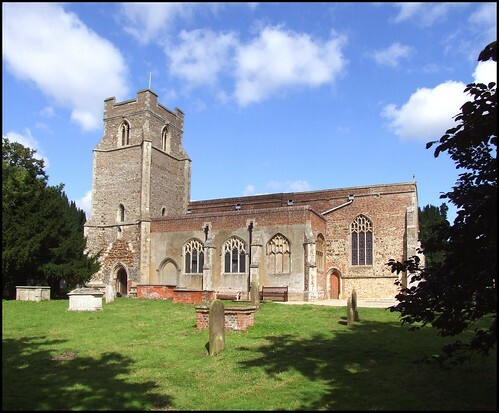 Clenche was High Sheriff of Suffolk, but is more famous, and more notorious, for being the judge who sentenced Saint Margaret Clitherow to death. In 1586, Margaret Clitherow, the middle-class wife of a York butcher, was accused of treason against the state. This was a catch-all charge designed to root out Catholicism; she was told, as all martyrs of the time were, that the charges would be dropped if she renounced Catholicism, and conformed to the Anglican church. This she refused to do, and also refused to enter a plea, saying that "having made no offence, I need no trial". Failure to make a plea was a capital crime in itself, of course, and Clenche's sentence was that you shall return to the place from whence you came, and in the lower part of the prison be stripped naked, laid down upon the ground, and so much weight laid upon you as you are able to bear, and thus you shall continue for three days; the third day you shall have a sharp stone laid under your back, and your hands and feet shall be tied to posts that, more weight being laid upon you, you may be pressed to death. Popular Catholic martyrology has it that Clitherow's only problem with her sentence was the bit about being stripped naked; the night before she was crushed, she supposedly made a shift to wear. This was not allowed her, but it was placed over the lower part of her body to preserve her modesty from the paying spectators. The final sentence was carried out on the 25th of March 1586. Brennan's Martyrs of the English Reformation recalls that a stone the size of a man's fist was placed under her back, her arms were stretched out and tied with cords provided; a door was placed upon her, and stones piled upon it by some beggars hired for the purpose. Her last words were 'Jesu have mercy upon me!' and when her chest was crushed her ribs protruded, and she was left in this postion for six hours. The body was thrown on a dunghill on the outskirts of the city, but was rescued after six weeks by local Catholics, who found it 'free of putrefaction'. In May 1970 she was canonised as one of the martyrs of England and Wales by Pope Paul VI. There are images of her at Holy Family church in Kesgrave, a few miles off, and at Our Lady Star of the Sea in Wells in Norfolk, and the story of her martyrdom can be seen in stained glass just across the border at the church of Our Lady and the English Martyrs in Cambridge.